Maurice Beatson’s winning roll is continuing, with victory this weekend at the Dannevirke A&P Grand Prix Show. 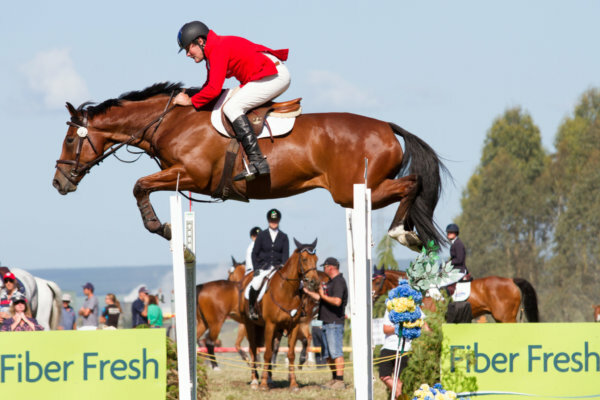 The veteran showjumper won nearly every start he had on Saturday, including the Dunstan Horsefeeds & EquiFibre Horse Grand Prix aboard Mandalay Cove, notching back to back wins in the series. Twelve started the class, and were well challenged by Marcus Rose’s course – his first show in the premier arena. Just Beatson and Stephen Nickalls (Palmerston North) aboard Letino came through to the jump-off where an early rail to the latter saw him claim second place. Beatson was rapt with his horse and praised Rose. Beatson was also sixth on his eight-year-old mare Gold Locks. Both of the horses are homebred. He has no intention of hanging up his boots just yet. In the Country TV Pony Grand Prix just Georgia Percy (Masterton) aboard Surprise Illusion and Lily Moore (Hastings) aboard Showtym Highlight mastered the first round and while both were double clear in the jump-off, the honours went to Percy with her time of 41.27 seconds. Moore stopped the clock at 44.1 seconds. Dunstan Horsefeeds & EquiFibre Horse Grand Prix: Maurice Beatson (Dannevirke) Mandalay Cove 1, Stephen Nickalls (Palmerston North) Letino 2, Matthew Irvine (Takapau) Wall Street III 3, Blake Davis (Palmerston North) Socrates de la Vie Z 4, Brooke Edgecombe (Waipukurau) LT Holst Andrea 5, Maurice Beatson (Dannevirke) Gold Locks 6. Country TV Pony Grand Prix: Georgia Percy (Masterton) Surprise Illusion 1, Lily Moore (Hastings) Showtym Highlight 2, Amy Gibbs (Marlborough) Kennebrook Duchess 3, Danielle Taylor (Wellington) Cee Cee 4, Lucy Buchanan (Hastings) Redcliffs Colour Me Quick 5, Laura Foss (Waimarama) Silver Xanadu 6. FMG Young Rider Series: Blake Davis (Palmerston North) Giggles 1, Blake Davis (Palmerston North) Socrates de la Vie Z 2, Ike Baker (Pauatahnui) Centrico 3, Matthew Irvine (Takapau) Wall Street III 4, Ike Baker (Pauatahanui) Hawkesdale Mahe 5, Parys Marshall (Taranaki) Alejandro 6. Dunstan Horsefeeds & EquiFibre Junior Rider Series: Samantha Carrington (Takapau) Double J Breeze On 1, Emmie Mulinder (Havelock North) Cheltenham 2, Brigitte Smith (Mangaweka) Corlinka 3, Meg Rogers (Ashhurst) Peti Peti Spitfire 4, Amy Gibbs (Marlborough) Soho 5, Amanda Steele (Dannevirke) Bear Essentials 6. Caledonian Holdings Amateur Rider Series: Dana Sutton (Palmerston North) Down Wind 1, Natasha Mazey (Pukerua Bay) Kabo Luna 2, Kaleigh Kent (Otane) Double J Sponge Bob Square Pants 3, Ashley Johnston (Wellington) Miss Vee NZPH 3, Noni Morgan (Hastings) Secret Keeper 5, Katie Hercock (Otane) Kiwi Express 6. Mitavite Six-Year-Old Series: Oliver Edgecombe (Waipukurau) Crescendo NZPH, Maurice Beatson (Dannevirke) Central Park, Lucy Fell (Longburn) Big & Rich and Jesse Linton (Hastings) Double J Promise =1. East Coast Performance Horses Five-Year-Old Series: Woodrow Hosking (Palmerston North) Toucan, Sally Clark (Dannevirke) Sun Flake, Alex Loiselle (Dannevirke) Diana NZPH, Kim Best (LT Holst Teachers Pet, Nicki Booth (Masterton) Coachella ECPH, Shanae McKay (Levin) KD’s Affair and Oliver Edgecombe (Waipukurau) LT Holst Elizabeth =1.